In a Dutch oven or large skillet, cook pork chops on both sides, in hot oil, over medium-high heat, for 5 to 7 minutes. Reduce heat to medium; cook until done, about 5 to 10 minutes. Remove from skillet; keep warm. In same skillet, over medium-high heat, add 1 to 2 tablespoons of the apple juice, to deglaze the pan, and cook onion in pan drippings until tender; stir occasionally. Add apple; cook for 5 minutes more or until tender. Stir in the rest of the apple juice and mustard; heat through. 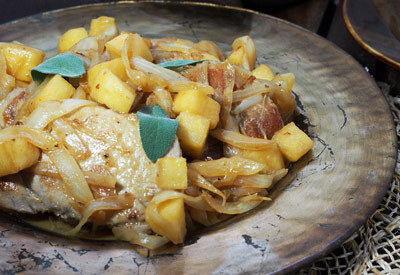 Spoon onion mixture over pork chops; garnish with sage leaves and serve immediately.